The unveiling of a fifth Super Bowl banner is the first of what the Patriots hope is a season full of milestones in Foxboro. Once the Super Bowl LI banner drops on Thursday night, New England will officially get to work on procuring a sixth Super Bowl title. Currently, the Patriots are tied with the Dallas Cowboys and San Francisco 49ers for the second-most titles with five. Only the Pittsburgh Steelers have more, with six. The Patriots have caught up to the Cowboys and 49ers by winning five Super Bowls since the turn of the century, during which time those once-proud franchises have combined for only one appearance in the big game (the 49ers lost Super Bowl XLVII to the Baltimore Ravens). Should New England advance to Super Bowl LII at U.S. Bank Stadium in Minneapolis, it will be extending its own NFL record of most Super Bowl appearances with 10. The Patriots’ ninth trip as a franchise last February broke a four-way tie at the top with the Steelers, Cowboys and Broncos. With a winning season, the Patriots can break another tie with the Cowboys and 49ers. New England has had 16 consecutive winning seasons dating back to 2001; the Cowboys (1970-1985) and 49ers (1983-1998) also had 16 straight. Even a 9-7 finish would give the Patriots the record with 17 consecutive winning seasons since the AFL-NFL merger. A 12-4 finish for the Patriots would give them their eighth straight season of 12 or more wins. This would break a tie with the Peyton Manning-era Indianapolis Colts, which won 12 or more games for seven straight seasons between 2003 and 2009. If New England is indeed one of the last teams standing this season, Tom Brady will undoubtedly have played a major role in seeing that through. There aren’t any significant quarterback records Brady is realistically within striking distance of this season, but if he reaches his goal of playing until he’s 45, he’ll in all likelihood be the owner of every major passing record there is. Can the Patriots Go 19-0? Brady is currently fourth on the NFL’s all-time list for passing touchdowns (456), passing yards (61,582) and completions (5,244). Some combination of Peyton Manning, Brett Favre and Drew Brees ranks ahead of him in all three categories; Manning leads in yardage with 71,940 and touchdowns with 539, while Favre leads in completions with 6,300. Brees, still active at age 38, is third on all three lists. 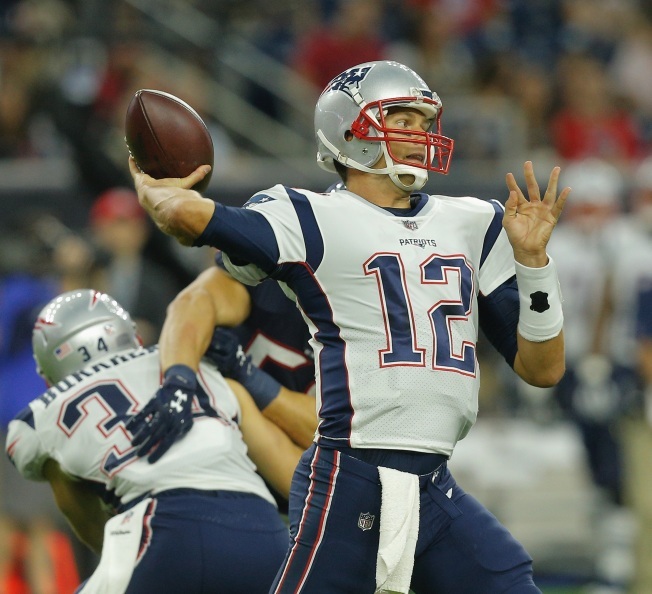 Brady has thrown a touchdown pass in the regular season to some 65 players, second-most in NFL history behind Vinny Testaverde. Newcomers Brandin Cooks, Dwayne Allen, Rex Burkhead, Mike Gillislee, Jacob Hollister and Phillip Dorsett can help Brady match or surpass Testaverde by season’s end. Favre is the only other QB to connect with more than 60 different receivers. Rob Gronkowski, who has caught more touchdowns from Brady (66) than any other player, has 68 career receiving touchdowns in total – more than any tight end currently in the Pro Football Hall of Fame. Tony Gonzalez, who’s not eligible for induction until 2019, is tied with Antonio Gates of the Los Angeles Chargers for the all-time lead with 111 receiving touchdowns by a tight end. Gronk has averaged 12 touchdowns per 16 games, meaning he’s on pace to surpass the retired Gonzalez at some point in the 2020 season. Special teams maven Matthew Slater is beginning his 10th season with the Patriots. Originally a fifth round draft choice in 2008, Slater is set to become just the fifth player drafted by Bill Belichick to last at least 10 years with the organization. Brady and Stephen Gostkowski are the only other players on the current roster who meet that criteria, while the retired Matt Light and Vince Wilfork round out the group. Julian Edelman, who will miss the entire 2017 season with an ACL injury, will be entering his 10th season in New England next year. With seven wins, Belichick can move past Tom Landry for third on the NFL’s all-time wins list by a head coach. Including the postseason, Belichick has 263 career victories. Only Don Shula (347) and George Halas (324) remain ahead of Belichick and Landry. Those are among the many things the Patriots will set out to accomplish in the 2017 season. Here's how I think these things shake out. Brady will easily surpass 4,000 passing yards for the ninth time in his career and 30 touchdown passes for the seventh time. Brady will throw for 4,739 yards and 37 touchdowns – numbers he was on pace for last season had he played in all 16 regular season games. Gronkowski will stay relatively healthy save for perhaps a maintenance game or two late in the season to get ready for the playoffs. He’ll catch 12 touchdowns from Brady to lead the team and also get to 80 for his career. Cooks will have little trouble getting acclimated to New England’s offense and go over 1,000 yards receiving for the third year in a row. He’ll be the lone Patriot to eclipse the 1,000-yard threshold, given how spread out the offense figures to be. Only five running backs in the Tom Brady era have amassed more than 1,000 yards rushing: Antowain Smith, Corey Dillon, BenJarvus Green-Ellis, Steven Ridley and LeGarrette Blount. None will get there this season, but it won’t matter. James White, who was second on the team in receptions last year with 60, better get his hands ready again. No running back has led the Patriots in receptions in the Brady era, but with Edelman – who led the team with 98 catches last year – gone, that’s about to change. White will become the franchise’s single-season leader in receptions by a running back with 80, surpassing Tony Collins’ mark of 77 from 1986. Stephon Gilmore got paid like a top-flight cornerback, and he’ll back it up by playing like one. Gilmore had a career-high five interceptions last season, which may be hard to top only because teams will grow tired of throwing in his direction. But he’ll get to six anyways, because his counterpart on the other side – Malcolm Butler – wants to be paid like Gilmore soon, too. Butler will also set a career high in interceptions this season, with seven. Absent a top-notch pass rusher to pair with Trey Flowers, the Patriots will struggle to get to 34 sacks as a team again. The 34 sacks for New England last season were its fewest since 2009. Flowers will fall victim to many a double team along the edge but will manage to surpass his total from last season (seven) and approach double digits, with nine sacks. After a down year – by his standards – Stephen Gostkowski will return to form kicking the ball for the Patriots this season. As it stands, Gostkowski is fourth in league history in field goal percentage at 87.069 percent, behind three other active kickers: Justin Tucker, Dan Bailey and Steven Hauschka. Prior to last season, Gostkowski had been over 90 percent on his kicks for three years in a row – including a career-best 94.6 percent in 2014. He’ll get back over 90 percent this season while continuing to create separation from himself and Adam Vinatieri on New England’s all-time scoring list; Gostkowski is currently 299 points ahead of his predecessor, with 1,457 points. The Patriots will win the AFC East once again and secure a first-round bye in the playoffs for an eighth straight season. They won’t be going 19-0; New England will lose at Denver to finish 15-1 in the regular season for the first time in the Brady/Belichick era. But with home field advantage throughout the playoffs, the Patriots will enact revenge on the Broncos in the AFC Divisional round with a 31-20 victory. The Patriots will then knock off the Steelers for in the AFC Championship Game for a second straight season with a 28-15 decision before traveling to Minnesota for Super Bowl LII. The Seattle Seahawks will be there waiting for the Patriots in a rematch of Super Bowl XLIX. It won’t take a Malcolm Butler interception on the goal line again, but the Patriots will prevail for their sixth Lombardi Trophy in a 21-18 victory.